Abby and I have decided to stop using Duracell batteries. I know we shouldn’t need to do this in the 21st century with a major brand name product, but in the past couple of years we have discovered with a great deal of consistency that Duracell batteries have corroded and damaged various devices in our lives. From now on, we are using Eveready Energizer (the one with the bunny in the ads) batteries. 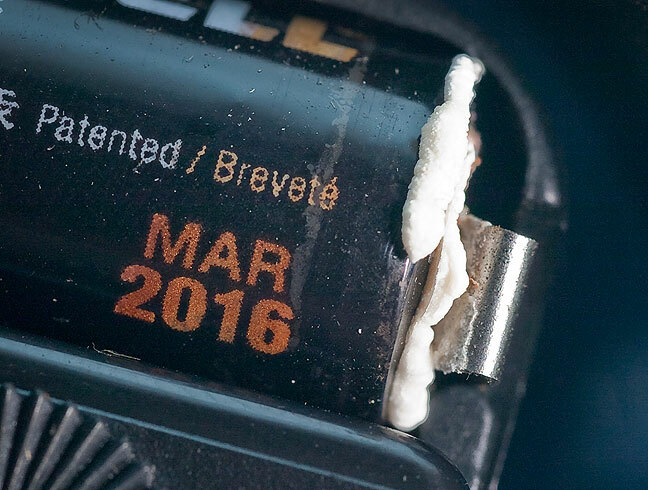 This is pretty plain evidence: a Duracell AA battery, with a March 2016 expiration date, in a wall clock stored at room temperature, has damaging corrosion on it. I have been using Energizer for a long time. When my boys were growing up they had lots of toys and gadgets that required batteries. I didn’t have a lot of money so I had to buy products that were the better value. I noticed that Duracell batteries didn’t last long at all. Sometimes they would be used up within a couple of hours. Even Dollar Store batteries lasted longer than Duracell. I tried Energizer and I discovered that they really do keep going and going and going. This year I gave another brand a try. ACDelco. I still use a lot of batteries with flashlights, remote controls, and whatnot. I bought a package of one hundred AAA ACDELCO batteries for 22.99 from Amazon. The customer reviews were good, so I gave them a try. According to the reviews, they are as good as Energizer, and I have found that to be true. I like buying products from Amazon. There is no sales tax or shipping charges. For all my photo gear that uses AA and AAA batteries (flash, radio triggers, remote controls, etc. ), I use rechargeable Eneloop batteries. For the kids’ toys (a LOT of them) that use batteries, we’ve been using Duracell without any issue for the past few years. The only batteries we’ve had fail quickly or leak/corrode were the ultra-cheap no-name batteries that often come with products.